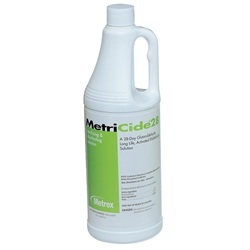 MetriCide 28 liquid instrument disinfectant and sterilizer in 1 quart bottle. Reusable for up to 28 days. Recommended for immersible and heat-sensitive equipment and instruments. Contains a surfactant. No dilution required. Manufactured by Metrex Research.